Whether your faucet's style is modern, traditional or transitional, you can ensure a coordinated look with Moen Soap Dispensers. With all the finish choices you need, this Soap Dispenser adds the perfect touch. This stylish soap dispenser in Silgranit White from BLANCO, will add a clean, modern look to your kitchen decor. The 15 fl. oz. capacity bottle is refillable from the top, which makes refilling an easy task. You can count on Delta reliability throughout the home, including our accessories and repair parts. We back each and every item with our lifetime limited warranty. Add drama to your bath with the award-winning Victorian(R) Collection. Enhancing the old-world charm of this series, matching accessories carry the look seamlessly throughout your bath. The soft curves and intricate, handcrafted details make it a beautiful bath collection reminiscent of a past era. iTouchless Stainless Steel Automatic Soap Dispenser is the easiest and most hygienic way to wash your hands in the bathroom and kitchen. Air Injection Technology creates a luxuriant foam that is rich and cleansing. This is the same technology used by hospitals to create a sanitary environment. This dispenser is made of surgical grade stainless steel material that is superior to other dispensers on the market. It is antimicrobial, fingerprint-proof, rust-free and easy to clean. A 28 Fl. Oz. bag of Famous Name Brand Liquid Foam Soap refill is included! Soap Dispenser Spot Resist Stainless Whether your faucet's style is modern, traditional or transitional, you can ensure a coordinated look with Moen Soap Dispensers. With all the finish choices you need, this Soap Dispenser adds the perfect touch. 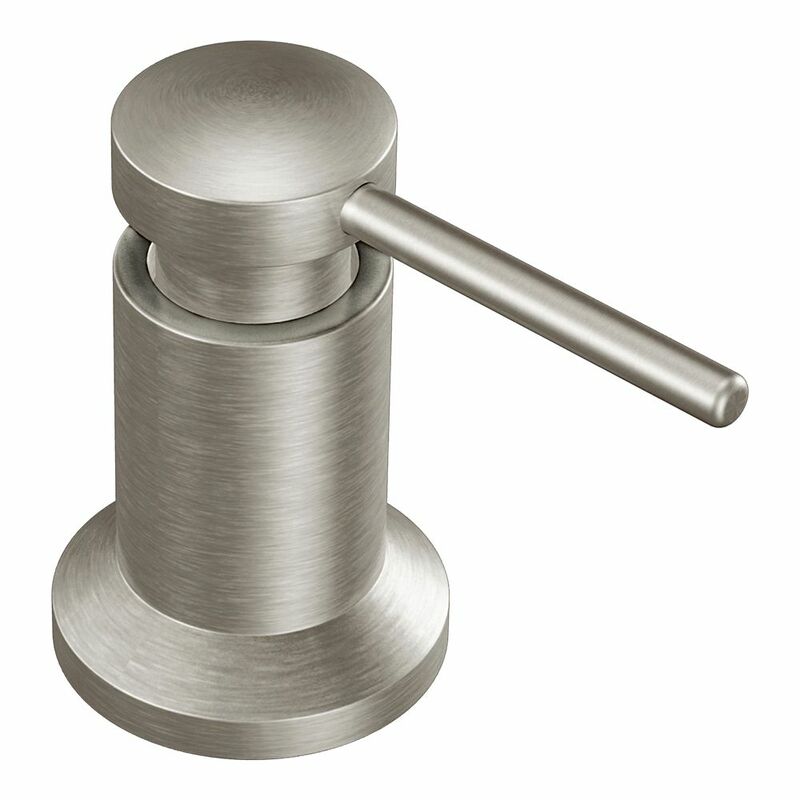 Soap Dispenser Spot Resist Stainless is rated 4.4 out of 5 by 97. Rated 2 out of 5 by Jc from The pump on the dispenser is too high above it’s... The pump on the dispenser is too high above it’s base. I contacted the company about the issue and they tried to resolve it for me, but the issue still remains. It could be simply a cosmetic issue with this type of dispenser because it works fine, but I’m just not crazy about the overall look.